The British government established the Imperial War Graves Commission in 1917 to care for the overseas graves of the Empire’s war dead. The new organization developed out of the British Army’s Graves Registration Commission, established in 1915, and in 1960 was renamed the Commonwealth War Graves Commission (CWGC). The British Empire chose to bury its battlefield dead from the First World War near the sites where they had fallen, and not to repatriate remains to their home countries, as many grieving families and politicians had demanded. 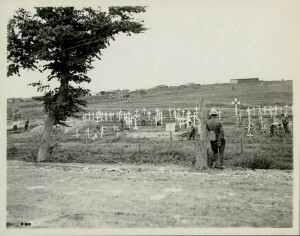 While thousands of bodies had been buried in makeshift graves during the fighting, military units, assisted first by the Red Cross and later by official grave registrars, had made efforts to note temporary sites for future reburials. After battles, special grave detachments attempted to collect the unburied dead for proper burial, and to disinter remains from temporary graves for proper reburial elsewhere. After the Armistice, this process began in earnest with the vastly expanded Imperial War Graves Commission moving remains into newly established imperial military cemeteries. The process involved tens of thousands of burials and took many years. It still continues on a smaller scale as agricultural or construction work across old battlefields regularly uncovers additional human remains. The Commission imposed a sense of social equality in its cemeteries and made no rank distinctions in the physical construction of grave markers. Each simple white headstone carries the name, rank, and unit symbol of the deceased, and a religious symbol if the soldier’s religion was known. 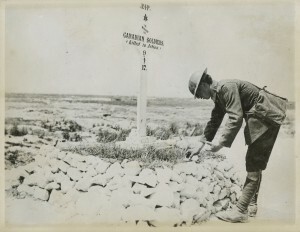 The unknown dead carry an inscription chosen by British author Rudyard Kipling, who lost a son during the war: “A Soldier of the Great War – Known Unto God.” No other personalized adornments were allowed other than the opportunity for next of kin to pay for a short motto to appear at the bottom of headstone. Today, the CWGC cares for the graves of 1.7 million members of Commonwealth forces who died in the two world wars and in subsequent conflicts around the globe. It maintains 2,500 cemeteries in over 170 countries. The Commission consists of six member countries – the United Kingdom, Canada, Australia, New Zealand, India, and South Africa. Member states jointly fund the Commission’s operations, but the United Kingdom pays more than 75 percent of the costs. 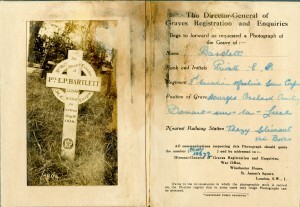 Photograph of the grave of Private Ernest P. Bartlett, sent by the British War Office to his widow, Sarah Bartlett. Most Canadians never had a chance to see their loved one's grave due to the cost and difficulty of travel. Private Bartlett was killed on 8 August 1918 and is buried at Hourges Orchard Cemetery, Domart-sur-la-Luce, along the Somme River, France.